the time for more organized play has finally come. 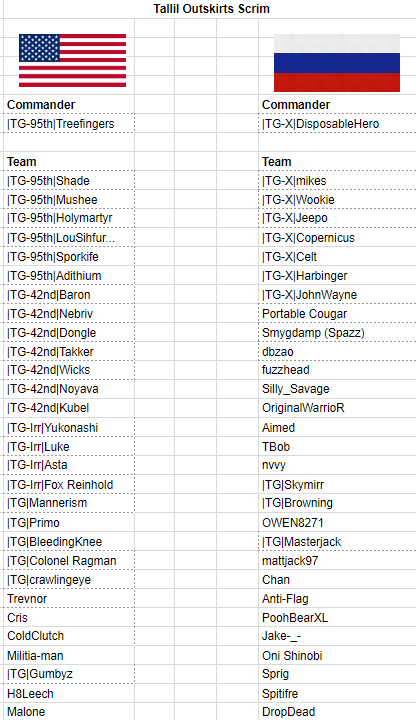 On friday, december 21st tg will be hosting our first internal scrim, pitting two commander-led teams of 39 players against one another in a pitched battle for supremacy of tallil outskirts. in my previous experiences at tg, all scrimmages required everyone that wanted to participate to register in response to a post like this one, indicating their willingness to participate. People would post what kit/role they would be willing to play, including commander. Sign-ups were always first-come, first-serve with the exception that a tg supporting member would always get preference in the order over non-sms. Once we went past the server capacity in sign-ups, those players would still be considered part of the scrim and be assigned to teams for planning, etc, but they were on stand-by in case someone else ahead of them had to drop out. Considering that people generally always backed out, it usually worked out that everyone got to play. Fast-forward to squad today. We have a server with 80 slots available, not the 64 we had for bf2-based titles (or even fewer for other games). To be perfectly honest, we probably still don't have the regular, core player base that we had in pr and so we probably couldn't even fill a 64-slot server today. However, that doesn't mean we can't still run an organized match. so to make this work, we're still going to run sign-ups. We're looking for players to volunteer to be squad leader and we're looking for 2 players to volunteer to be team commander. We also just want general sign-ups, because as all of you know by now, roles on the team for sls are not just infantry roles, but also logistics, armor, etc. If you're not comfortable being an infantry sl, you can still volunteer to lead a logistics squad, a tank squad, an apc squad, a scout squad - whatever. Bottom line is don't be afraid to volunteer for some leadership. If you absolutely do not want to sl, specify that when you sign up. We're going to try to mix tg players into the squads as evenly as possible (more on that below), so just specify what role you want to play. Make sure it you send a dm, not a message in a public channel as those will be rejected and you won't be registered for the event. The admins will receive a notification of your registration and we will make sure we post those sign-ups for all to see when we receive them. the admin team intends on trying to make these scrims a monthly event. If they pick up in popularity and as everyone gets used to them we may begin to run them more frequently, but for now we're going to stick with once a month due to the logistics of the event and allowing enough time for proper planning. If you have any questions or concerns, feel free to post them below or you can directly message myself or any of the other admins on discord. Last edited by disposableHero; 12-20-2018, 10:43 AM. Sign-ups will close next Friday, December 14th at 6pm Central. The time has come! Get ready boys! Mothers birthday, will have to skip. Nice to see that we are almost 40!